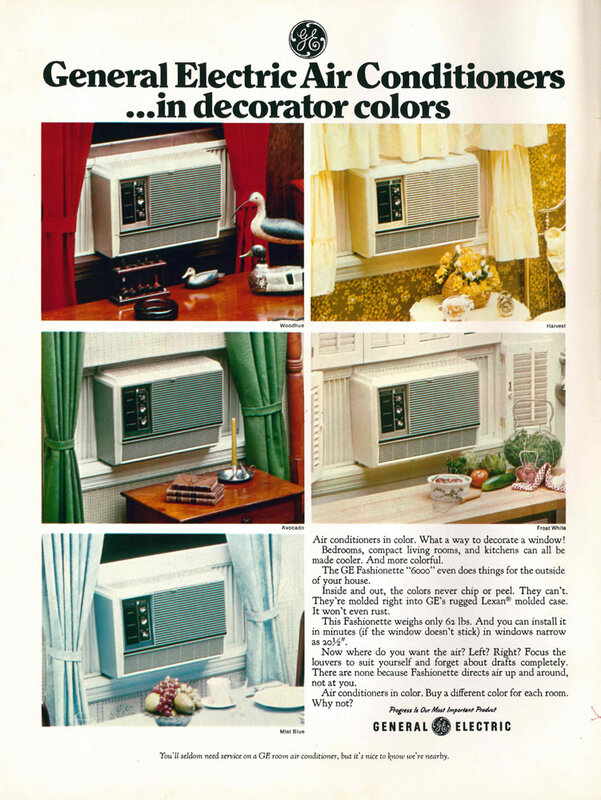 Except for Brady-Bunch Orange, all the worst late-60s colors in one late-60s GE ad! *I have been informed that Harvest Gold is darker than simply Harvest, but still lighter than the infamous Harvest Black. Air conditioners in color. What a way to decorate a window! Bedrooms, compact living rooms, and kitchens can all be made cooler. And more colorful. The GE Fashionette “6000” even does things for the outside of your house. inside and out, the colors never chip or peel. They can’t. They’re molded right into GE’s rugged Lexan® molded case. It won’t even rust. This Fashionette weighs only 62 lbs. And you can install it in minutes (if the window doesn’t stick) in windows narrow to 20 1/2”. Now where do you want the air? Left? Right? Focus the louvers to suit yourself and forget about drafts completely. There are none because Fashionette directs air up and around, not at you. Air conditioners in color. Buy a different color for each room. Why not? You’ll seldom need service on a GE room air conditioner, but it’s nice to know we’re nearby. This entry was posted in ads of yore and tagged 1960s, 60s, ads, advertisements, advertising, air conditioners, colors, ge, general electric, magazine ads, magazine advertisements, old, old ads, print ads, print advertisements, sixties, vintage, vintage ads on April 26, 2016 by Clayton Hove.